Sanrio World Smash Ball! is not only amazingly competent, it’s amazingly addicting and fun. You might say it’s a smash, or a ball. Sorry. 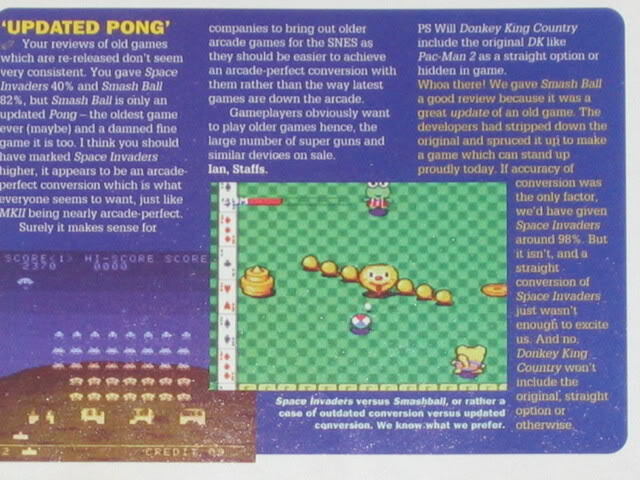 Back in the early-mid ’90s many popular franchises outside of video games had its own game at some point. These often resulted in forgettable platformers. 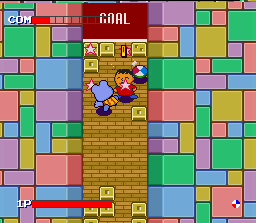 Sanrio Smash not only attempted something with a hint of originality, but it succeeded at delivering a quality product, which cannot be said for many licensed video games of the time. May 19, 2005, is a day I’ll never forget. 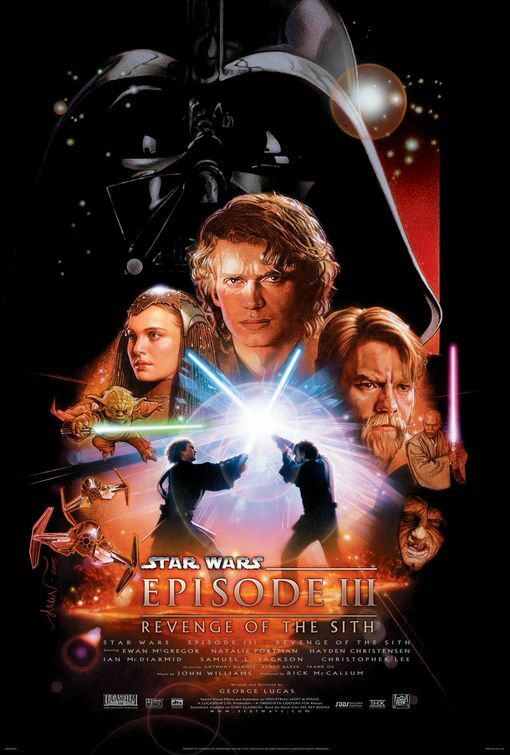 It was on this day that my friend and I caught the premier of Star Wars: Revenge of the Sith. It was a pretty good return to form — it didn’t touch the greatness of the original trilogy but was a far cry from The Phantom Menace and Attack of the Clones. But I recall that day fondly for another reason as well. It was the day I was unofficially hired by Sanrio. I had an hour to kill before showtime, so I decided to scour the mall. It was quickly approaching the end of my Spring 2005 semester. I was 22 and looking for a summer job. 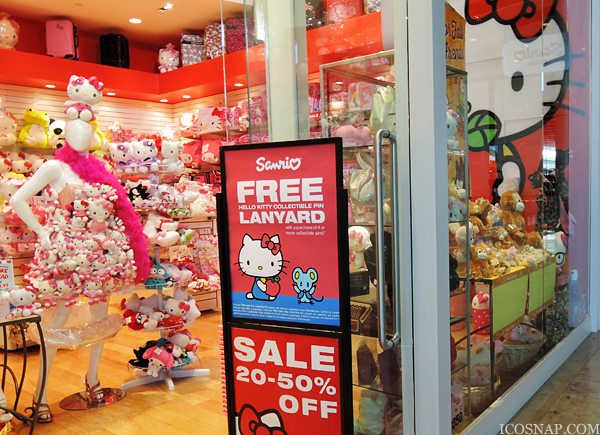 Walking by Sanrio on this particular day I couldn’t help but notice a sign posted on the window. 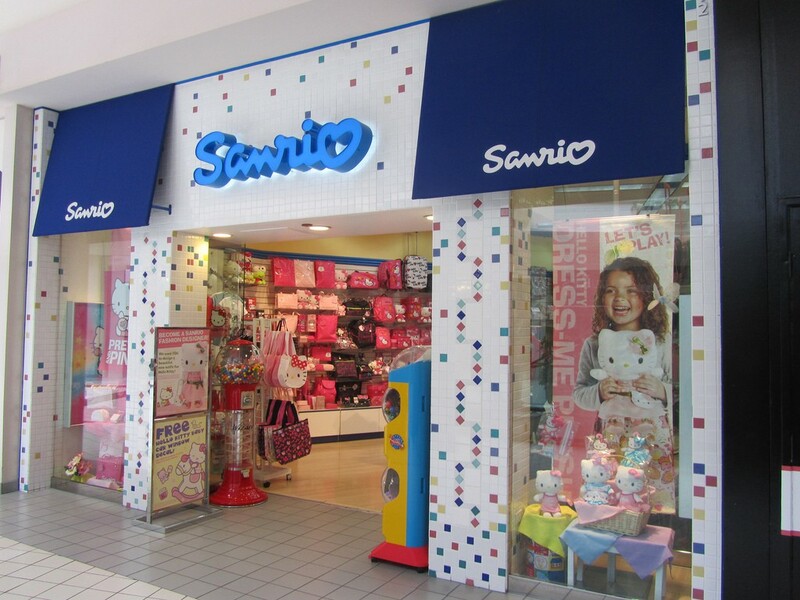 And then for the first time in my life, I voluntarily walked into a Sanrio store. There was a cute young girl at the counter, probably 19 or 20 years old. She looked at me like I was joking. When she realized I wasn’t, she gave me one. I grinned, and then in a surreptitiously confident manner, uttered the words that I knew won me the job then and there. The reaction on her face was priceless. I walked out on that note, leaving her hanging. Two days later they called me in for an interview. I nailed it and was hired on the spot. My first shift, the mall was packed like a sardine can, and they assigned me to take care of the Wheel Game where I ask customers to pay two dollars to spin for a mystery prize. 3 (most common and cheapest prizes), 2, 1 and Grand Prize were marked on the wheel, so everyone wins something. Before I went to it one of my coworkers came over and told me to limit the Grand Prize winners. “But if they land on it, how can I change that?” I asked. Then she showed me a little knob on the back of the contraption. When twisted, you could get JUST enough on it to move the arrow indicator one space forward. That afternoon a couple kids did land on the Grand Prize, and I never once manipulated the knob. This one’s for the little guys — LITERALLY! For the next 7 months I was a salesclerk there. On the weekends I took charge of the Wheel Game because the boss said I made more money on it than the girls ever did, or could. I had the magic touch. Being the only male had it ups and downs, of course. I walked the ladies to their cars whenever I closed. I always answered the phone, because random guys would call and be creeps. Imagine their surprise when I picked up. On the downside, prices were ridiculous and I had to sell overpriced crap I didn’t care for to would-be consumers. After a while, that sort of wears you out. All in all though, it was a memorable experience. 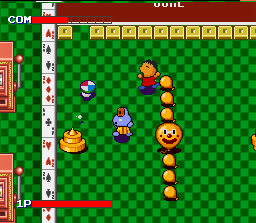 So when I got back into the Super Nintendo roughly a year after working at Sanrio, I discovered there was a Super Famicom game based upon Sanrio. 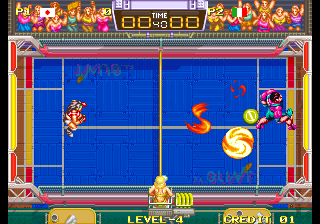 It looked a bit like Windjammers – I was completely sold. 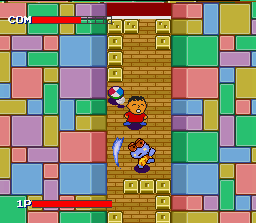 Sanrio Smash was actually released July 1993 though, while Windjammers came out February 1994. So you can’t call it a Windjammers clone. Instead call it a perfect blend between Pong and Breakout. 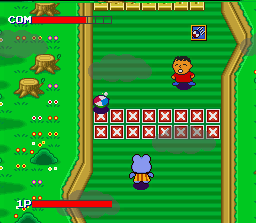 Weighing in at a HEFTY and whoppin’ TWO megs, Sanrio Smash is the smallest game on the SNES, tied with Mr. Do! and Space Invaders. Tales of Phantasia and Star Ocean, both 48 megs, are 24 times bigger than Sanrio Smash. Thankfully, size doesn’t matter [Yeah, is that what she said? -Ed.]. As you can see, the visuals are serviceable enough. It’s a simple and fun 2 player game. I know the cutesy nature may turn off some but don’t let that fool you. 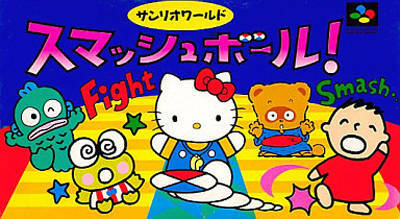 Sanrio Smash is an addictive and competitive game with many different level layouts. There are also power-ups inside blocks. For example one will instantly eliminate all the blocks protecting the opposition’s goal line, making him ripe for the pickings. Some stages have X marks, which serve as a restriction line. There are some stages though that allow you the ability to go where you please. As you progress the design gets crazier. Here’s one of my favorites void of those annoying X marks. 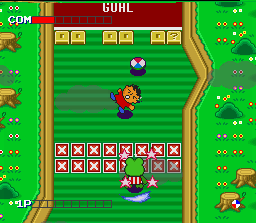 The seesaw continuously rotates, affecting both players’ strategy on the fly. Aside from your standard left and right swats there’s a super shot. By holding a button you’ll charge up a power bar. When full, pressing X enables your power shot, sending the disc flying straight ahead at 250 miles per hour. Your guy will swing his arms twice in a circular motion, so it’s possible to hit the disc twice in succession if it bounces off a block and comes right back to you. The bar will only fill up when you’re standing still and holding a button. It can be re-filled as many times as you wish. Using my super shot, the first hit connects and breaks a block. It immediately ricochets back to me before my super shot animation expires, allowing for a second hit. And this time around, my opponent has no answer. Some of the stage designs are very unique. There’s a 1-player mode, password option and 2-player mode. 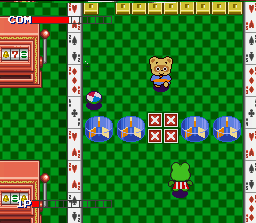 In 2-player mode you have 20 stages to pick from, and 4 Sanrio characters. Some of the stage gimmicks are pretty cool, like this pinball-inspired layout. As the disc is making its rounds, you’d be wise to power up… watch. Now powered up, my possessed looking frog friend is free to advance upward, ready to unleash hell on that poor boy. Sanrio Smash is loads of fun, and a great modern update on Pong. 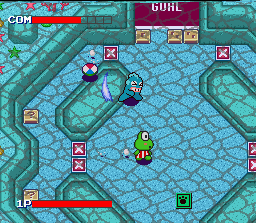 There aren’t too many games like this on the SNES, which makes it noteworthy. When you factor in that it’s really good too, you have a nice little gem well worth having in your library. Note: the game has no music during gameplay (hey, it’s 2 megs after all). It’s just the sound of the disc being hit back and forth. Just pop in your favorite CD — problem solved! I’ve yet to meet anyone who has played this and didn’t like it. In other words, it has quite a few fans and I suspect you’ll enjoy it too, if you can look past its license. It’d be a shame to dismiss this game based solely on that. 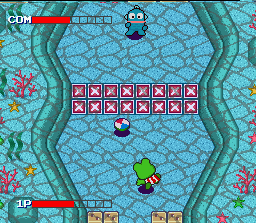 On a final note, if you like this, I also recommend checking out Pop’n Smash. It’s very similar and a decent companion piece to Sanrio Smash. 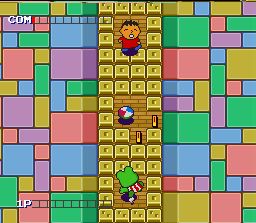 It’s clearly a clone as it came out April 1994 (nine months after Sanrio Smash). It doesn’t play as well, but I really enjoyed that one, too. Can’t go wrong with either or better yet, both!